Some advice for Milnerton Ridge residents regarding the world of Fibre To The Home (FTTH). Fibre Provider, e.g. FrogFoot, Vumatel, Octotel etc. The complexity lies in these two layers of providers, the installation and connection fees, and the technical line specifications such as 4/2, 10/5, 20/10, 202/20 40/20, 50/50, 100/100, which confuses non-tech-savvy customers. 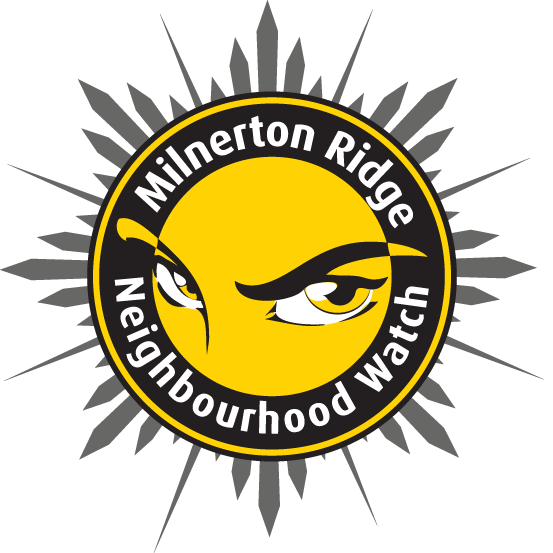 To summarize my findings – which I’ve collected in my personal capacity and is based on the information I have extracted from various sources and articles on the internet, I would recommend that Milnerton Ridge residents support FrogFoot for reasons of Quality of Service, Support and Value for money. And prevent our sidewalks from being dug up twice. 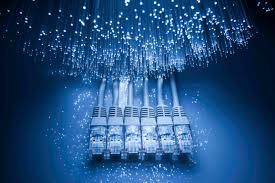 Below is my take – taking into consideration all the various aspects of fibre installation. Having chatted to the FrogFoot Communications Officer, it’s not uncommon to have more than one provider in a neighbourhood, but this means having your sidewalk dug up multiple times. This seems to be the main gripe with most customers – the damaged caused by the installation. Note that the Fibre Provider, not the ISP that you sign up with, lays the cable to your gate and then also installs the last bit from your gate till into your house. 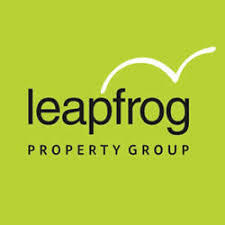 FrogFoot is the Fibre Provider that has been communicating with us for the past 18 months and it is their intention to have fibre laid by 15 December 2019. It looks like Octotel (a different Fibre Provider) is also eyeing Milnerton Ridge, judging by their coverage map. So use the below information to determine which ISP to sign up with, which will ultimately determine which Fibre Provider will lay the fibre along the Milnerton Ridge pavements. Fibre requires a different router than your standard ADSL router. Often ISPs loan a new, pre-configured device to you. These are not of great quality but you will need one. Some ADSL routers can support Fibre out of the box. A quick comparison of the common fibre service providers in our area e.g. 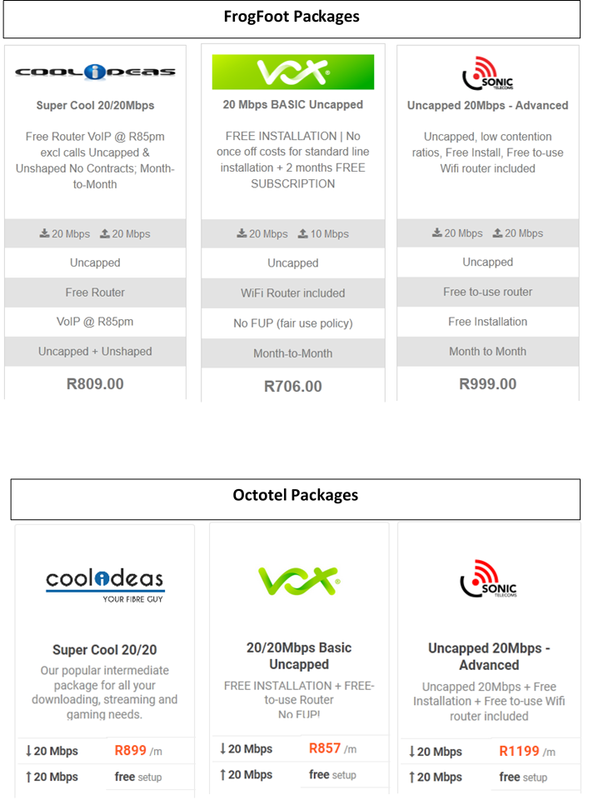 Vumatel, Frogfoot, Octotel, shows that the ISP’s using Frogfoot infrastructure is more than 10% cheaper than the competitors. 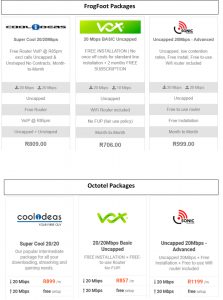 One configuration that is easily comparable is the 20/20 Mbps offering where Frogfoot is a R100 cheaper per month. Here is another comparison, this time between Octotel and FrogFoot, across 3 ISPs. Researching via the internet it seems that FrogFoot also outperforms the other ISP in terms of “Quality of Service” and “Support”. This is however from end June 2017 but I doubt a huge change since then. The main complaints are regarding damage to property, water pipes and plants so this is something that is an area of concern, but this is a similar trend with all the other fibre installers. I hope this information helps when making the decision on which package to sign up for.